Timthumb was a very popular php script for dynamically generating thumbnail images. That said it’s outdated and has performance issues when used with a modern web host like Kinsta. The following is a walkthrough showing the steps I took to remove Timthumb from a custom theme for one of my customers. Using grep on the command line you can quickly see all places where Timthumb is being used. Copy that output into https://regexr.com and use the regex timthumb.php.+h=(\d+)&w=(\d+) to select all thumbnail dimensions combinations. Under the Tools change the output to $1 $2\n which will output those dimensions. Take those thumbnail dimensions into Google Spreadsheet and manually imply which sizes are actually needed. Start by grouping together similar aspect ratios and remove duplicates. For my set I was able to go from 11 unique dimensions down to 3 as shown in the following table. 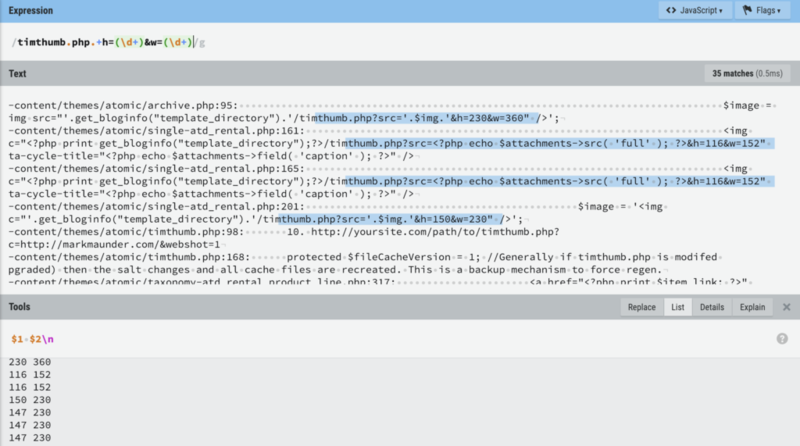 Add proper thumbnail images to the functions.php theme file as shown here. Next generate all missing thumbnails with a WP-CLI one-liner wp media regenerate --only-missing. Lastly, update each of the theme files to use the new format. While this may vary depending on how the thumbnails were embedded, here an example of what that might look like.